Missouri weather always seems to impede on its state’s wineries. From harsh, cold winters to potentially drought-filled summers, the weather is tough on grapes. Now researchers at MU are looking for commercially viable varieties that can withstand Missouri’s weather. On March 25, 26 and 28, the Grape and Wine Institute (GWI) at MU hosted its fourth annual Experimental Cultivar Wine Tasting on the campus of the University of Missouri in Columbia. The event supports the Missouri Grape and Wine Board who uses the research to help Missouri wineries find marketable new grapes. This is the fourth vintage in a planned seven-year study to identify new wine grape cultivars that can thrive in Missouri and make excellent wine. The Grape and Wine Institute has two experimental vineyards, one in Ste. Genevieve County south of St. Louis and the other in Howard County in north/central Missouri. Combined, the vineyards grow more than 50 different varieties. University of Missouri student viticulture crews tend to the vines and graduate students make the wine used in the experimental tastings. Leonardelli said the same Lalvin 1118 yeast is used for all 19 wines and the wines are made in the same style each year. No malolactic fermentation is used. Because of the drastically hot and dry summers of 2011 and 2012, GWI has moved away from using the same varieties every year. Usually, the Institute only accepts yields of 200 or more pounds. This year, the requirement was reduced to no less than 150 pounds. Leonardelli assigned random numbers to each wine to randomize the flight organization. (From left): Jessica Pearcy from St. James Winery and James and Charla Fashing of Cedar Lane Vineyard blindly sample wine on Tuesday, March 26. To judge each flight, a modified version of the 20 point UC Davis scoring system was used. Participants rated wines on: clarity, color, aroma/bouquet, acidity, body/texture, flavor/taste, bitterness, finish, and quality. After each flight, Leonardelli revealed the tasters’ scores and information about the wine including growing conditions during the vintage year. 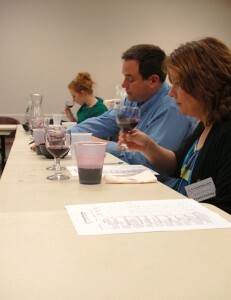 Aroma and taste characteristics for each of the wines were also reviewed for the participants. A mix of grape growers, vineyard and winery owners, industry workers and wine consumers scored the wines at the event. The number of attendees has slightly fluctuated with 60, 40, 75 and 50 people attending in 2010, 2011, 2012 and 2013 respectively. After four years of analysis, the GWI researchers are noticing some general trends among the varietals, but the weather has slightly disrupted the continuity of the results. For example, Valvin Muscat was the most popular white wine with tasters for 2009 and 2010. But the severe drought of 2012 reduced the University’s supply of Valvin Muscat grapes and there was not enough of the varietal to be included this year. ‘Valvin Muscat provides consistently high quality, semi-dry wines with spicy, floral Muscat aromas and no bitterness.” according to Leonardelli. He says more Missouri wineries and vineyards have started planting this grape. Blumenhof Vineyards and Winery in Dutzow won the 2011 Missouri Governor’s Cup for their Valvin Muscat. Petit Manseng, which has a fruity flavor and fair cold hardiness, has done consistently well in the tasting the past four years. Sémillon, another white wine with a plethora of aromas including fruity, floral, spicy and even herbal, has been one of the top varietals too. 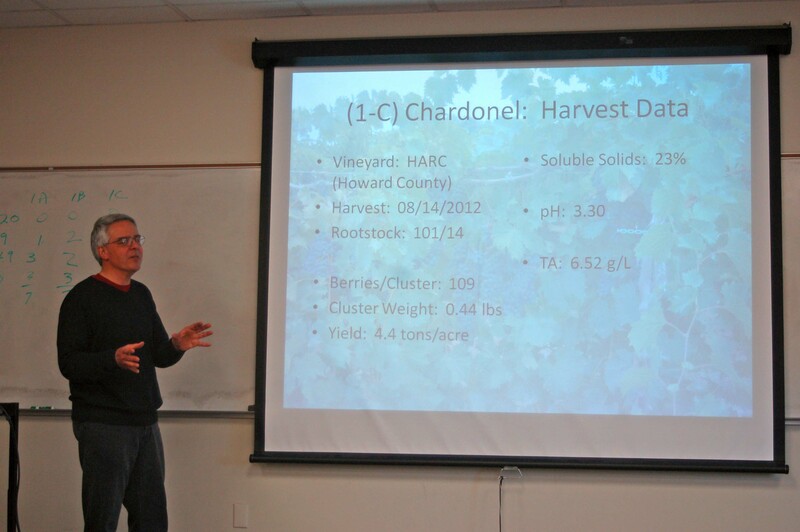 Enologist Michael Leonardelli explains the growing characteristics for the tasting’s Chardonel. For the reds, Tempranillo has been a steady scorer. It has a low acidity with smells and flavors consisting of strawberries, cherries and plums. In addition, Teroldego, an Italian grape, which is comparable to Zinfandel, has also scored high. Noiret and St. Croix have done well in year’s past, and Leonardelli thinks they will become successful blending grapes. 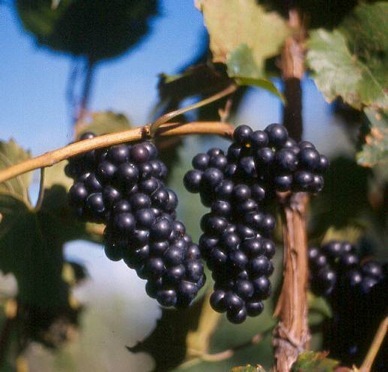 The GWI’s experimental research was originally set up for seven years, but Leonardelli said that the number of grapes might be reduced to four to six varieties after this year. Now that they have basic research regarding what experimental cultivars work best, the focus could shift to experimenting with different styles and learning how the grapes grow best using different techniques. The Missouri Grape and Wine Board will review the Institute’s funding after the fiscal year, but it seems wineries are responding well to this research as some of these experimented cultivars are beginning the process of commercialization. One future goal is to conduct surveys asking how many wineries are using these new varietals and which ones they use. Next story Are You Prepared? Guidance For a Friendly TTB Audit.